Whiplash vs. Iron Man, sounds like a five-minute fight, and pretty much is. However, as Tony Stark (Robert Downey Jr.) is the winner on the day, the whip-wielding Ivan Vanko (Mickey Rourke) wins the title belt, by showing a global audience that their ultimate saviour can actually be opposed, dented and have aspects of his technology stolen. In short he obliterates the suit of armour Stark hides within the most - his self-confidence. Already under the eye of S.H.I.E.L.D. and it's top agent Natasha Romanoff (The Black Widow to us comic reading folk), the loss of public and corporate faith in both Stark and his company sees Tony spiral out of control. As Pepper Potts (Gwyneth Paltrow) tries to steady the ship, the Pentagon presses on to obtain the "Iron Man weapon" and rival weapon manufacturer Justin Hammer (Sam Rockwell), seizes the opportunity to make a play for Starks biggest contracts, while negoiating on the side with Vanko to take Stark out once and for all. Yes, you're right; that is allot of ground to cover, and that's aside from the intro of War Machine, Tony's health problems, Samuel L. Jackson's brilliance as Nick Fury, or S.H.I.E.L.D. Agent Coulson's horror over finding the remains of Captain America's shield, and what Stark intends to use it for. 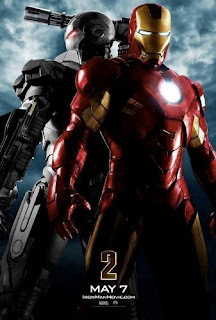 In servicing all the varied plot points the movie does flip round quite a bit, but that's how an Iron Man film should be - pedal to the mettle with the action, fun and character interaction at full throttle. Flawless chemistry between Tony and Pepper again grounds this sequel, however both get upstaged by Scarlett Johansson, in the role of Ms. Romanoff. Proving she's got more than enough bite to handle the bitter and sweet of the role, Scarlett easily devours every scene she is in - providing the best female performance in a comic film since Michelle Pfeiffer took up the cat-whip in Batman Returns. 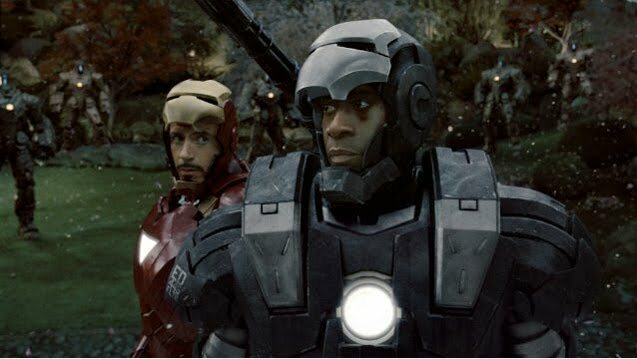 Her fight sequences are stunning, and while the War Machine armour does its best to upstage her, I would happily fork out for a decently written 'Black Widow' spin-off, based on her work in this film alone. Hope the review hasn't spoiled anything for anyone, I tried really hard to keep it free of revealing anything major. After all these years of collecting IM comics (I started back in the 100's of the original run), if someone had told me he'd one day be a strong contender to beat Spidey and the X-Men for the Marvel star with the first decent trilogy I'd have laughed in their face... now not so much. I haven't seen the movie yet but I am really excited, I think Mickey Rourke did a pretty job acting as a villain. What I really like about the previous line up of Marvel movies is the way they were intertwined and slowly creating an intro for the upcoming Avengers movie. Hey Vic - If you like how the movies are tying together you'll love IM2! As I said above Caps shield plays a fun role, S.H.I.E.L.D speak like there's stuff going on all over the globe and then there's the after credits scene which really kicks the shared universe into high gear.